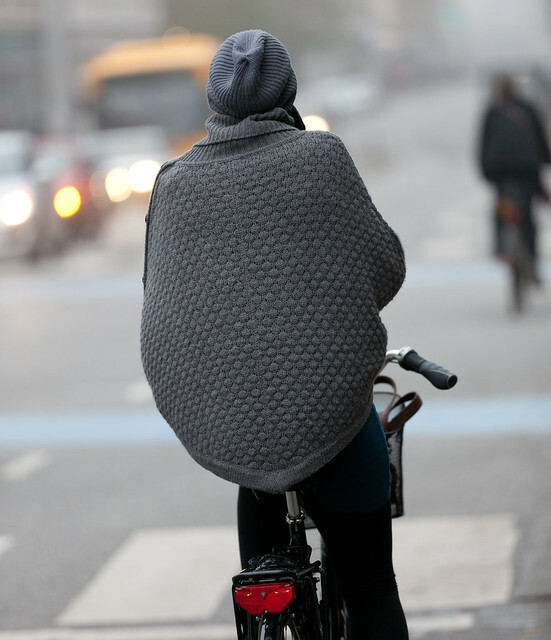 Grey is a color of choice this winter in Copenhagen. Preferably spun in natural wool to underline the understated elegant streak. Easy to accessorize. Black/White, Red/Green. Grey is easy on the eyes and works well with almost everything. 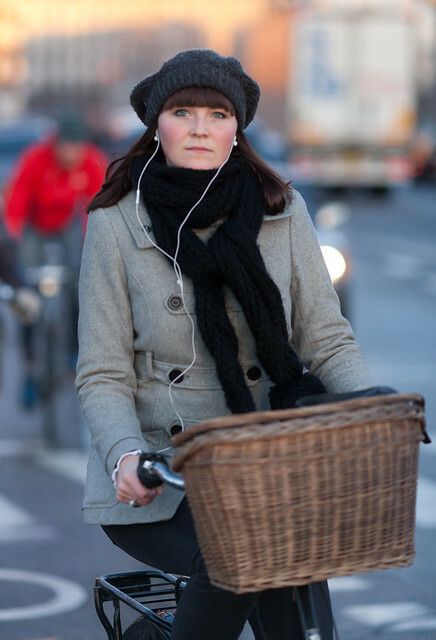 Besides looking good, wool is great for keeping you warm on a cold morning ride. There are a lot of comfortable ride-friendly half-length coats and capes to choose from. Especially lots of Surtout drawn coats - with over-sized buttons to match. Above double lined buttons with dark-grey Grand Beret on top and below single line buttons topped off with a matching grey Beanie Hat. Perfectly presentable and entirely practical. Top buttons only make for maximum mobility, with a wide overlap to avoid adverse winds creeping in. Oversized scarf and grey bag to go. Grey poncho. Turquoise dress. Black leggings. All draped in the hazy morning greyness. The large buttons are set over her left shoulder and - another Copenhagen favourite - the mobile phone in her right hand. Isn't grey or various shades of black, navy and of course grey the colour of every season every year in Denmark. Dullsville. Needs a serious injection of colour and individuality less homogenous living. I love color ,but shades of black and grey are always in vogue. Classic is cool. Great blog! Winter color is definitely grey ... So sad !! Why people are not trying to enjoy color in these season of darkness ?? Not to dress like a clown but a nice colored shirt is good for the mood !! PS : 3rd picture is very nice. She seems to said "Yep, i try a touch of red today." Grey is the perfect thing for this time of year. Quiet and not too jarring against the landscape. Somehow it seems to suit the quality of light, and it does go with anything. I especially like it with other soft and heathery shade, and with brown. My dream bicycle is painted grey, with brown leather, wicker and wood accessories. Looking good in the light! How is it with a big fluorescent yellow band across it as the sun sets>? This is a series of photographs featuring grey. Rather silly to look at a series of four photos and assume that's what EVERYONE is wearing. Five years of this blog and it's safe to say we've shown you the splashes of colour that winter brings in Copenhagen.